Martinez makes ASP ratings leap after repeat Billabong Pro Mundaka win! 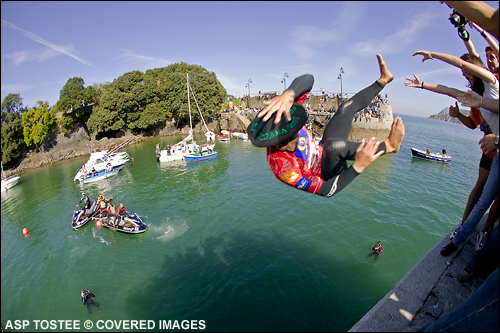 MUNDAKA, Spain (Sunday, Oct. 14, 2007) –What started as a dream became reality when defending champion Bobby Martinez (USA) became the first surfer in the history of the Billabong Pro Mundaka to post back to back victories at the reeling lefthander today. Martinez beat Foster’s ASP World No. 3 Taj Burrow (AUS) in a closely fought Final to defend his Billabong Pro Mundaka title and post best result of the season. Burrow lost the final by less than three-tenths of a point, despite posting an excellent 9.33 (out of 10) wave score toward the end of the heat. Martinez bettered his low score by catching the set wave after Burrow’s and the Australian was unable to answer back. Martinez jumped from 13th to 6th on the Foster’s ASP World Tour ratings with the win. Previous to his win today, the Californian had posted one 3rd, one 5th and five 17th place results on the 2007 tour. He finished World No. 5 last year to become the 2006 ASP Rookie of the Year. Nic Muscroft wins Ocean & Earth Pro! NIC MUSCROFT (AUS) WINS OCEAN & EARTH PRO 4 STAR WQS IN CANARY ISLANDS ! Nic Muscroft (Victoria,AUS) won the Caja De Canarias / Ocean & Earth Pro 4 Star World Qualifying Series event today at El Confital. Pocketing a US$ 10 000 prize for his first place and valuable 1500 points counting for the WQS ratings, Muscroft clinches his first title of the year and keeps all his hopes alive towards a possible Foster’s ASP World Tour qualification. The next leg of the UK Pro Surf Tour is set to hit the road for the weekend of the 20th to 21st October held at Longsand Beach, Tynemouth, This will be the fifth leg of eight UK Pro Surf Tour event locations. It is also the first leg of three separate events on the Relentless Triple Crown in association with Wavelength magazine, combined, this will be the largest scaled event seen on tour this year. Australian surfers Toby Atkins and Dara Penfold win the ‘2007 Elusive Welsh Open’, the 4th of 8 UK Pro Tour (UKPST) competitions being held this year. The developers of part of the £1.5 billion Silvertown Quays mixed use regeneration project have released conceptual images of Venture Xtreme, a unique surf centre and extreme sports complex, the first project of its kind in the world, designed by Baca Architects. 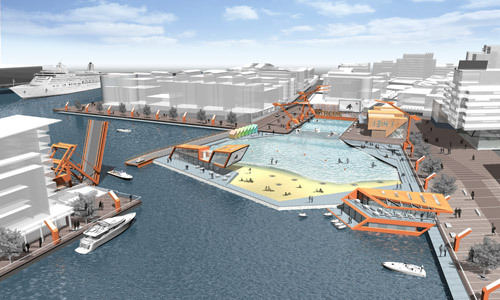 The surf centre is a conceptual project which may form part of the visitor attraction area at Silvertown Quays. If it goes ahead the surf centre will be located alongside the aquarium Biota! and will include London’s largest permanent outside beach and a surf pool with perfect waves all day every day! HUNTINGTON BEACH, California (Monday, Oct. 1, 2007) – Former Association of Surfing Professionals (ASP) World Champion C.J. Hobgood (Melbourne Beach, FL) has claimed the 2007 ASP North America Men’s Title, following a stellar start to the season which saw him win three major regional events. You are currently browsing the archives for October, 2007.